Eckhart Tolle, the author of the bestseller, "The Power Of Now" which has changed millions of lives and continues to do so as more and more people are awakening to a greater spiritual reality encompassing all creation, collectively co-creating a new Earth where the old limiting paradigms of separation & fear are replaced by the divine wisdom of Oneness transforming humanity into fully conscious spiritual super beings, us !
" The One Thing "
Since the publication of The Power of Now, I have given hundreds of talks and teaching sessions all over the world, and in the course of those seven years, the teaching evolved. While the essence remained the same (The Truth is timeless. ), new perspectives arose, new signposts, alternative approaches to the Truth, as well as an added sense of urgency. A New Earth reflects this evolution and this urgency. 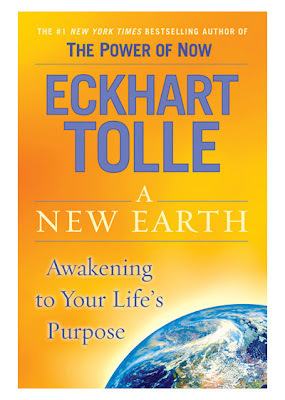 If The Power of Now worked for you and changed your life – as it did for countless people all over the world – there is no need for you to read A New Earth (although you may enjoy reading it and may find some of it helpful in recognizing the ego and thus sustaining the state of Presence). My feeling is that A New Earth will make the teaching (the one thing) accessible to an even wider audience, including people who perhaps would not have dreamed of reading a “spiritual” book but have within them a hitherto unrecognized longing for spiritual awakening. A New Earth will also be extremely helpful for those who read The Power of Now, found it interesting, but somehow missed the essence of it. It presents them with new perspectives on the same truth, new signposts, pointers towards Presence. Different pointers work for different people.